The weather is just the weather, right? There aren’t many ways to make a weather report more interesting, or so we thought. 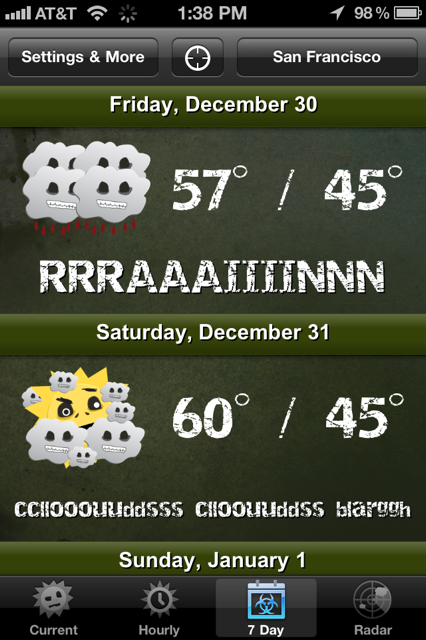 Weather Zombie is an app that puts a rather entertaining spin on pretty ho-hum data from AccuWeather. I don’t know which is funnier, the site itself, or the thought of someone sitting around and saying “Do you know what would make the weather more interesting? Zombies!”. Either way, I’m a fan. 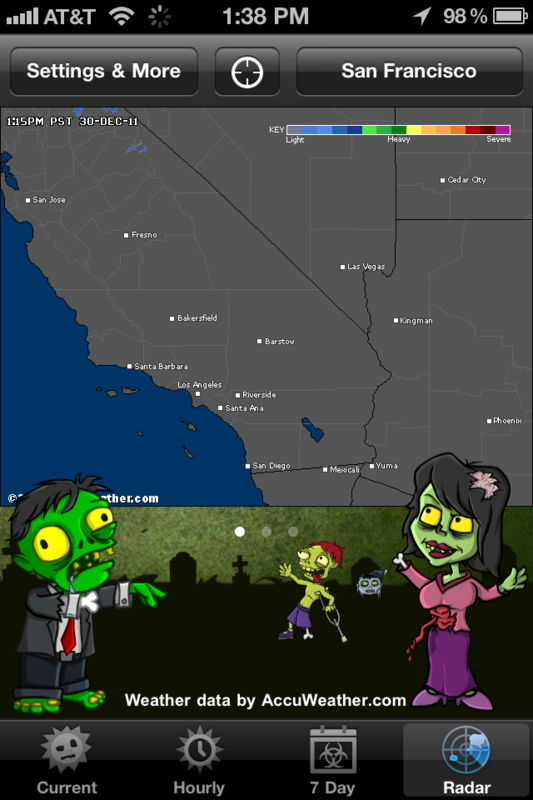 When you visit the web version of Weather Zombie, your location is automatically picked up and you’re shown the current weather in your area with a zombie twist. Along with random artistic zombie characters, the site shows the weather in “zombie speak”. Whether you’re trying to figure out if it’s going to rain out today, if you can walk around unimpeded by brain-hiding hats and umbrellas, or if you’ll have to deal with the increased smell of decay due to an unprecedented heat wave, this is the weather app for you. So if you’re bored by regular old weather forecasts, or happen to be a fan of zombies, give Weather Zombie a look. Just watch out for your brain, I hear that zombies like those.